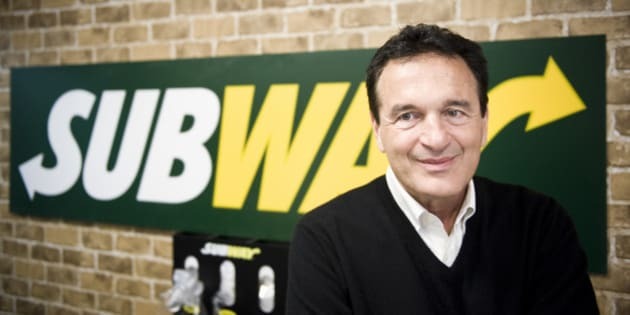 NEW YORK — Subway co-founder Fred DeLuca died Monday evening after being diagnosed with leukemia two years ago, the company said Tuesday. He was 67. "I knew nothing about making sandwiches, nor the food industry," DeLuca later wrote in a book. DeLuca and Buck opened their first store in Bridgeport, Connecticut, in August 1965 under the name "Pete's Super Submarines," with the priciest sub selling for 69 cents. The name was changed to the snappier "Subway" in 1968, and the pair decided to start franchising to fuel the chain's growth. Earlier this summer, Subway announced that DeLuca's younger sister, Suzanne Greco, would take over as president and oversee day-to-day operations. In his book "Start Small Finish Big: Fifteen Key Lessons to Start — and Run — Your Own Successful Business," DeLuca recalled living in public housing in the Bronx as a child. His father hadn't graduated high school, but his mother had stressed the importance of education while growing up. "It wasn't intended to support me forever," DeLuca wrote.